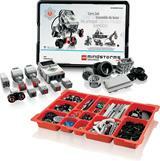 LEGO Mindstorms EV3 is the next generation of buildable and programmable robots from LEGO Education. It's coming out in the second half of 2013, first for educational users in August and then the home edition to follow (hopefully in time for the holidays.) But the education and home sets are not the same. If you're thinking of buying EV3 either for classroom or home use, or perhaps for a club or camp, then it's useful to understand the differences and which range will better suit your needs. Both versions of EV3 use the same Programmable Brick and range of sensors, but what you get in the box is different in each case. The education kit is designed for classroom use and learning, while the focus of the home kit is building cool robots that you can control and have lots of fun with. Clearly kids will be learning lots at home and having fun using EV3 at school, but the focus is different. The education kit, as you would expect, is targeted towards use in the classroom. It has companion STEM education resources so that kids can work through a syllabus, learning about data collection and analysis and other STEM topics as they build and use their robots. The home edition includes a remote control and IR receiver so kids can build remote control robots. The models that you can build with the kit demonstrate the use of the LEGO Mindstorms app which allows kids to control their robots from a smart device. (Or AA Batteries) Uses AA Batteries (not included) Or you can buy a rechargeable battery pack. Both the Education and Home Editions use compatible motors, sensors and other add-ons so you can add to a basic set so you can make more models. The individual components will be available to buy so you can extend your set whatever you start with. The technic pieces included are different to support the different models that you get instructions for. Gyro Boy (left) is a Education Core model. R3PTAR (right) is a Home Edition model. EV3 has a new icon-based graphical environment for programming the brick from a computer. I think the basic software package is included in the Home Edition - graphical programming is listed as a feature. But it's important to note that the EV3 software is an additional cost to the Education Core set, and so is the educational curriculum. There is a home education version that bundles together the EV3 Core with the software and curriculum - it's quite expensive so probably an option for a home ed group. your sensor and power section is reversed. both can use a battery pack, but the education comes with a battery pack, however without a charger.